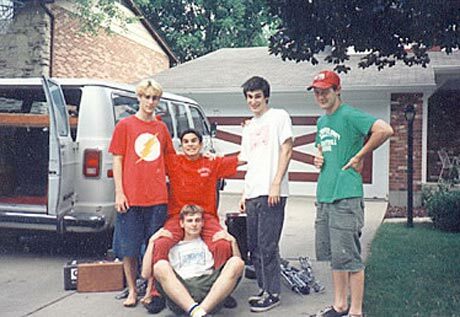 Davey von Bohlen on Cap'n Jazz Reunion: "No Definite 'Plans,' Per Se"
As we recently told you, seminal emo rock quintet Cap'n Jazz were rumoured to be plotting a reunion in 2010. While few details were known, it was said that the band's original line-up had been practicing, with a tour in mind. Now, guitarist Davey von Bohlen (Promise Ring, Maritime) has responded to the rumours. In an email to the A.V. Club, von Bohlen said that the rumours that the band had played together were true, but insisted that fans shouldn't get too excited. "We did play together one time, though there are no definite 'plans,' per se," he said. "A ten-day tour sounds pretty arbitrary, and is something I won't likely be doing. I'm not sure about the possibility of shows either. I suppose the likely outcome of rehearsal is a show, but we're all in pretty different places that could yield pretty wildly different outcomes to this. There is a possibility of some reissue of the anthology in some form, though at this point it is putting the cart before the horse. Like I said, one practice." The site goes on to say that von Bohlen might be wrong. Fellow Cap'n Jazz member Tim Kinsella has a show scheduled for Chicago's Empty Bottle on December 20 with his band Joan of Arc, and the Chitown rumour mill suggests that Cap'n Jazz might play a brief set. Besides, von Bohlen wasn't even in the original line-up, so a reunion without his involvement is also possible. This also says nothing about the rumoured reunion of Cap'n Jazz's math rock infused offshoot, Owls, who were also said to be reuniting under a different name. Since von Bohlen was never involved in that project, this is still a possibility. Cap'n Jazz and Owls Reuniting?